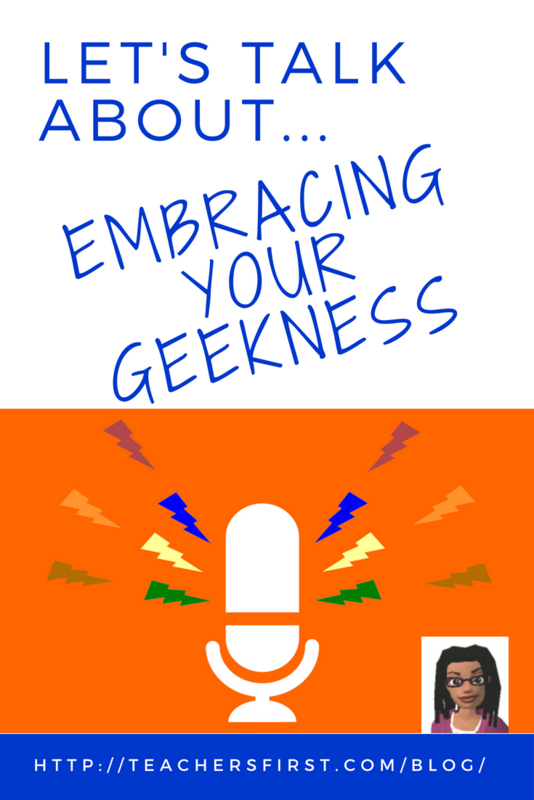 July 13th is “Embrace your Geekness” day. I just found out, and I’m very excited! If you were called a “geek” in the late 20th century, it meant that you were smart and tech-savvy. Today if you are a “geek” it means that you are an expert or well-informed enthusiast of almost any distinct social group. I am going to celebrate twice because each of those definitions applies to me. Teaching geeks will do almost anything to make their students successful. They collect different teaching strategies so that they can use them to reach students who don’t respond to typical instructional sequences. Teaching geeks like to talk about these strategies and are constantly trying to learn new ones. You find these teachers in Twitter chats in the evening, or at Edcamps on Saturdays. They spend lots of time trying to find better ways to engage their students, understand the synergy of teaching and learning, or just talk with others who share the same passion. Last month, Karen discussed a quote from David Guerin. As both a tech geek and a teaching geek, I totally agree. Schools need teaching geeks. They bring a palpable enthusiasm into the classroom. Oftentimes their superpower can change lives – not only for their students but their peers as well. Keeping that level of drive powered up can take a toll on even the best teacher geek. 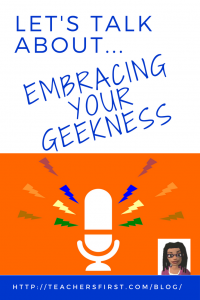 Here are a few ways to get recharged and embrace your geekness as you celebrate on July 13th. Study a framework. This summer the TeachersFirst team will be taking a look at the Triple E Framework as part of our book study. The website is a robust source of information on the framework and will provide the tools you need to try application exercises as well. Join a Twitter chat. There are education chats every day of the week. Here is a searchable list of some of the more popular ones. Chat archives are available at the website as well. Take an online class. The Microsoft Education Community offers a number of online courses for free. From 21st Century Learning Design to STEM and coding and even Office 365, you can pick a learning path and receive badges and certificates. Remember – sharing is caring…add a comment or lesson plan while you are there. Watch a webinar archive. Many organizations share webinar archives for free even if you are not a member. Try ASCD, edWeb or TeachersFirst’s OK2Ask webinars. Read (and reflect on) a blog post. There are lots of great blogs out there for teacher geeks. A few of my favorites include Cult of Pedagogy, Getting Smart, and the ISTE Blog. What other ways have you found to recharge? Share in the comments below.